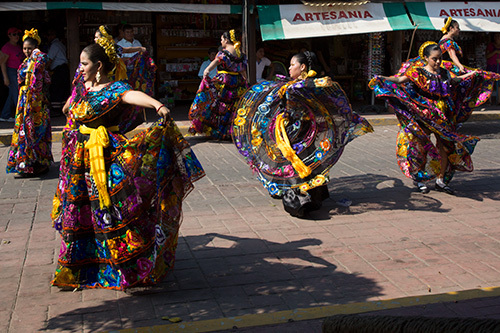 Zihuatanejo offers scores of exciting things to do on your vacation. 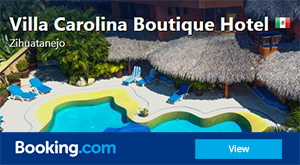 Whether you’re interested in swimming, fishing, golfing, snorkeling, scuba diving, para sailing, bicycling, dancing, dining, or shopping, you will find everything you need within close proximity to Villa Carolina Hotel. We can also help with reservations and tours for excursions such as Ixtapa Island, deep sea fishing, golf, and much more. Discover an underwater world abundant with life while snorkeling at beautiful beaches like Manzanillo Bay, Las Gatas Beach, and the Ixtapa Island. There is a diverse abundance of big game fish, such as marlin, sailfish, dorado, tuna, and more. The Mexican Pacific of “La Costa Grande” is equaled only by the Sea of Cortéz. Leave the bay of Zihuatanejo early in the morning, enjoy the scenery, and challenge your catch on the open sea. On your adventure, you may be able to spot giant turtles, dolphins, or even some gray whales (during the winter). The Palma Real is our traditional 18-hold golf course with beautiful landscaping and spectacular views as you play down towards the beach at Ixtapa Bay. This course is excellent for all handicaps. The Marina 18-hole course is a more recent design with a slightly higher degree of difficulty. It features several water hazards and narrow fairways. 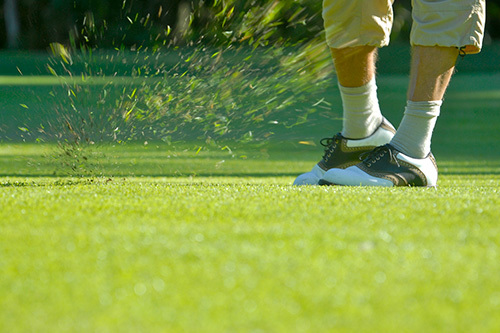 Reserve your tee time through our Hotel Concierge. Also ask about Villa Carolina’s free club rentals and booking discounts. Zihuatanejo often hosts surfing tournaments and is a great place for wave lovers. For over 40 years, surfers in the Zihuatanejo area have been exploring the great points, reefs, and beach breaks that adorn the 2000+ miles of sun-drenched Mexican coastline. Enjoy the laid back lifestyle of both the people and the surf scene in Mexico and the consistent swells that bless the region. Mexico’s Pacific beaches are no longer a secret, but you can still find plenty of uncrowded lineups. Those looking to escape the sand and surf can head to the rope course at Parque Aventure about 3 miles north of Ixtapa. Located in a tropical forest, Parque Aventura has many zip line courses and canopy platforms. Fun for everyone! Licensed local, special, and federal tour guides and taxi services are available for personalized tours of the area. This is an excellent way to custom tailor a visit to your liking and learn about the history of the region. Within a small radius of Zihuatanejo, you can discover beautiful architecture, plantations, museums, religious and sacred grounds, wildlife, and a variety of lifestyles. See how coconut oil is made or ride a horse on the beach while watching for dolphins – there are endless possibilities!